A postcard sent to the Morosky Family. The family would have included Anthony Harry Murosky, Jr. and his wife Helen Tillie Bukowski. Note the spelling variation of Murosky as Morosky. The postcard was postmarked August 11, 1945 at 5 pm out of Buffalo, New York. The post card was sent by Helen B.,most likely Helen Bukowski, the niece of Helen Tillie Bukowski. Helen Bukowski, the daughter of John Frank Bukowski and Theresa Filipkowski, was in Buffalo, NY visiting the family of William F. Bukowski. William Bukowski, Helen's uncle, was the brother of Helen Tillie Bukowski and John Frank Bukowski. It appears several Bukowski family members traveled together. Helen writes in her postcard that she is with her cousin Leona. 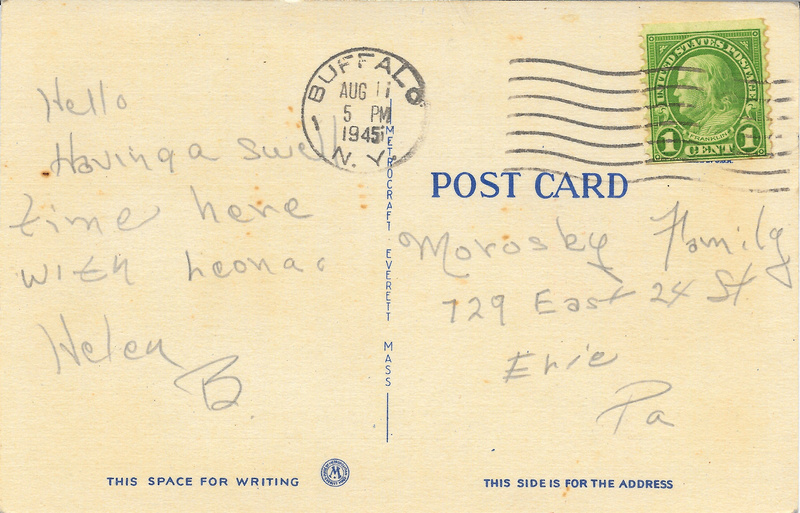 Helen Tillie Bukowski also received a postcard from her niece Leona Pietrzak, postmarked August 1945 out of Buffalo. To view that postcard visit the post 1945 - A Postcard from Buffalo, NY. William F. Bukowski and his wife Celia were originally from Erie, Erie County, Pennsylvania. Their son Norbert was born in July 13, 1920 in Pennsylvania. 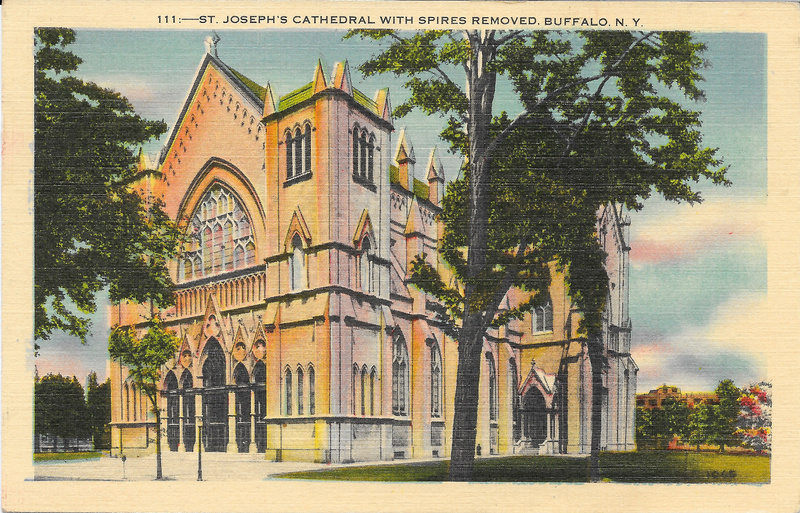 The family relocated to Buffalo prior to 1930. The 1930 United States Federal Census recorded the family living in Buffalo, Erie, New York. Helen would been 16 years old when she sent this postcard to to her Aunt Helen. The Postcard Collection includes postcards from the 1940’s that were included in the Helen Tillie Bukowski Collection. In addition to saving photographs Helen also saved newspaper clippings, postcards and greeting cards. Editing and digital restoration by Michelle M. Murosky. Helen Bukowski is my 1st Cousin 2x. Her father John Frank Bukowski is my 2nd Great Uncle. He is the brother of Helen Tillie Bukowski, my Great Grandmother. Helen's son Arthur is my paternal grandfather. U.S., Department of Veterans Affairs BIRLS Death File, 1850-2010. Record for Norbert Bukowski. 1930 U.S. Census, New York, Erie, Buffalo, 1930 United States Federal Census Schedule; Online Images, Record for Bukowski, Boleslaus. Lines 67-78.